China Cosco Holdings reported a first-quarter loss of $166 million just hours after being forced to make its second unusual trading announcement of the month as rumors that the carrier would be merged with China Shipping Container Lines continued to galvanize the market. The carrier’s loss-making quarter was still a 45 percent improvement on the loss reported during the same period last year, and it came even as shares soared by more than 20 percent in the past three days, triggering the need for an explanation by the container unit of the mainland’s largest shipping line. China’s state media reported on April 16 that Beijing was planning to consolidate several of its state-owned giants that would include the merger of China Cosco, CSCL, Sinotrans and China Merchants Group. This lit a rocket under the share price and forced the first denial from China Cosco. The rumors resurfaced today and elicited the second response to the stock exchanges, which as far as denials go appeared strangely open ended. “Up to now, neither the company’s controlling shareholder nor the company has received any information, in written or oral form, related to the above rumor from any government departments. Neither the company’s controlling shareholder nor the company has expressed any such intention to any departments or enterprises,” China Cosco told Hong Kong and Shanghai shareholders. For the first quarter that ended on March 31, the container volume handled by China Cosco’s fleet of 183 vessels reached 2.34 million TEUs, a healthy increase of 12.8 percent year-over-year. The group’s fleet had a total capacity of 891,496 TEUs with 10 orders for container ships with a total capacity of 117,960 TEUs. China government subsidies for scrapping 22 old and inefficient vessels saw the carrier gain $9 million during the first quarter, although the disassembly and decommissioning of the vessels saw the carrier shouldering a non-operating expense of $55 million. Total throughput of the group’s container terminal business was 16.47 TEUs, an increase of 6.6 percent compared to the same quarter of last year. The Bohai Rim terminals handled the largest share of the group’s throughput, although they posted relatively flat growth of 1.1 percent in the first quarter year-over-year. Operating revenue grew 4.4 percent to $2.3 billion. The group’s Pearl River Delta terminals handled 4.4 million TEUs in the first three months of the year, a solid increase of 12.7 percent year-over-year, while 2.5 million boxes flowed through the Yangtze River ports, an increase of 4.2 percent over the same period last year. 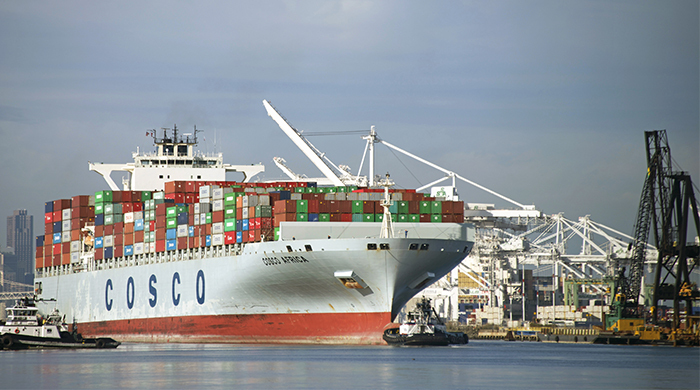 China Cosco has remained removed from the frantic mega-vessel ordering trend but is reportedly planning to order at least 10 ships of 19,000 TEUs at a cost of $1.4 billion. It is the lead member of the CKYHE Alliance that includes “K” Line, Yang Ming, Hyundai and Evergreen, which ordered 11 of the mega-vessels earlier this year. The ships will all have to be deployed on the Asia-Europe trade.